As a young man, Joseph Goebbels was a budding narcissist with a constant need of approval. Through political involvement he found personal affirmation within the German National Socialist Party. 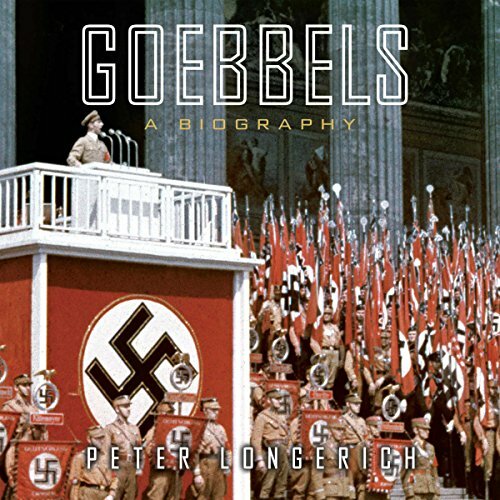 In this comprehensive volume, Peter Longerich documents Goebbels' descent into anti-Semitism and ideology and ascent through the ranks of the Nazi party, where he became an integral member of Hitler's inner circle and where he shaped a brutal campaign of Nazi propaganda. This is an excellent book, but I highly recommend that anyone not familiar with the subject matter get some background or they risk feeling that this book is incomplete. William Shirer's, "The Rise and Fall of the Third Reich" or "Berlin Diary" would be helpful. 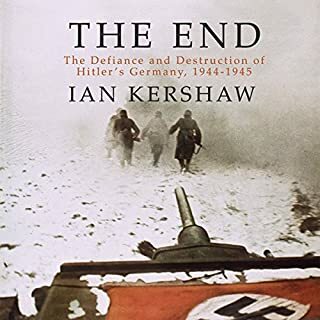 The serious student may be interested in reading Ian Kershaw's fabulous 2 volume biography of Hitler, "Hubris" and "Nemesis". Overall an excellent biography. Not very much here is new per say. But another very detailed and thoroughly written account with quite a number of intriguing psychodynamic (Not Freudian!) asides regarding Goebbels narcissism. The author heavily cites previously unpublished material from Goebbels diaries. However, I strongly discourage anyone who unfamiliar with either WWII, Nazi Germany, or Joseph Goebbels to start here as it makes for quite stale reading at times. Dr Longerich's writing style is academic which doesn't lend itself to keeping the readers attention for marathon reads. Therefore I would recommend "beginners start with the classic"Dr Goebbels" by Manvell & Fraenkel. 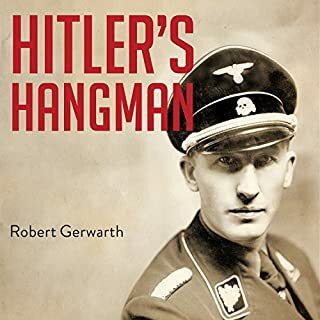 This book held my attention, for the most part, but since it was almost entirely based on the contents of Goebbel's diary, some sections were just dull. Secondly the book jumped around more than necessary rendering it confusing at times. All in all however, as a devotee of this era, I enjoyed it. I found this bio a mix of odd contradictions, perhaps much like Goebbles himself. Relying heavily on Goebbles voluminous diaries, it is comprehensive, but offers little biographical detail before 1923. It catalogs Goebbles crimes but at times seems oddly sympathetic. It paints a vivid portrait of a narcissistic, self-aggrandizing man, but also a fawning Hitler acolyte. 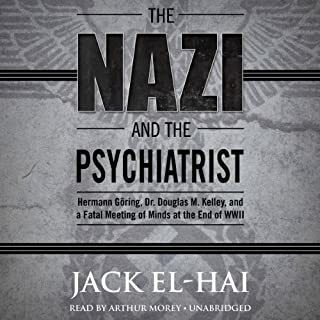 The sum amounts to an engaging and informative audiobook , though it assumes the listener will have some background familiarity with the historical characters and events. Was Goebbles a despicable criminal who stirred the pot of anti-semitism and whose propaganda machine justified the Nazi regimes crimes? Absolutely. But he was also a complex and macabre interesting character which the book does a good job of conveying. I found the narrator a bit disappointing, not only in tone but in his frequent mispronunciations of German names and words. Still it is worth a listen for history buffs. 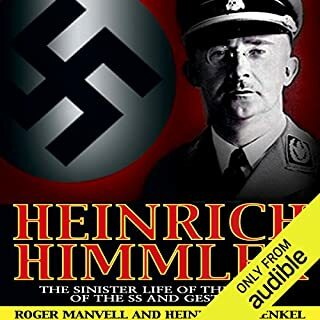 In buying this book the question I wanted to have answered is: what explains the success of the undoubtedly wicked man who became the Nazi propaganda minister? If you're curious about this, keep looking. Most readers know that Goebbels was a bad man and want to know how he succeeded. But what Longerich is primarily interested in is telling us that Goebbels was horrible. Longerich is on a mission to convince the reader that Joseph Goebbels was stupid, crass, a womanizer, a cuckold, crazy, a clueless academic, a clever wicked schemer and a naive politician. These characteristics don't easily add up to a single person, but Longerich doesn't really try to make them fit together. One has the sense that he combed through Goebbels' records with a checklist of bad character traits in hand. Listening to this book is like learning about Goebbels from your Sunday school teacher. Authors like Longerich put the reader in an odd position. Since according to Longerich virtually everything that Goebbels did was stupid, clumsy, etc., it's left to the reader to critically analyze the facts. Here is an example. At one time, Hitler weakened a group where Goebbels worked, but increased Goebbels' personal power. Goebbels was happy. Longerich's conclusion: Goebbels had been naively politically outmaneuvered, and was foolish not to see it. Maybe, but isn't it also possible that Goebbels calculated that his colleagues' and even their groups' loss could be his personal gain? He would not be the first politician to do so. This case shows what is true throughout the book: we never see the world through Goebbel's own perverse eyes, as a world in which he was some sort of hero. All we get is condemnation of Goebbels, and you can have that without reading this book. Longerich is not the man to tell the story of Joseph Goebbels, but Simon Prebble is definitely the man to read Longerich's attempt. I was surprised at this, becasue Prebble is usually reliably good. But just as Longerich refuses to try to see the world through Goebbels' eyes, Prebble has apparently never bothered to consider the language of Goebbels. Place names and personal names are a disaster, and I found myself pausing the recording to try to figure out what Prebble could possibly have meant. Or consider 'volkish', a word that this unhappy listener estimates appears one billion times in just the first few pages, and which Prebble consistently pronounces with the English rather than the German 'v' (the German 'v' is pronounced like the English 'f'). The German 'Volk' and English 'folk' have a common ancestor, and it would be both correct and more helpful to pronounce 'volkish', "folk-ish". But instead the word is mispronounced again, and again, and again. The book, in other words, has gotten the narration it deserves. Very static. No emotion. It's as if the author sat with the diaries in front of him and commented as he turned each page. Was a struggle to listen to and glad it ended. It's 28 hours I'll never get back! Ok the time spent listening to this book is well spent. The research is very well footnoted. The facts well explained. But I have to agree with an earlier reviewer, if the man was so very naive, and so self-involved that he was not aware of the really sharp sharks Hitler gathered about him...How did he get to be so very powerful? The fact that he was evil doesn't really need pointing out. What I really wanted to know is how this porcine, rather comic looking man, who made his fancy military dress uniform look like a clown suit, get to the inner circle of one of the best political machines of the century, not to mention one of the best war machines ever created. The book doesn't exactly explain that, or perhaps I do not understand the explanation. But on all accounts the book is thorough and accurate, even if it is not a psychological profile. Simon Prebble's voice was a pleasure during the hours I spent listening to some very unpleasant history. I would for the history. What other book might you compare Goebbels: A Biography to and why? 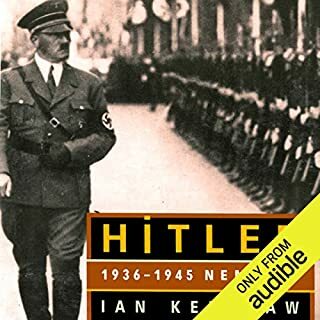 It is just as good, no, better then the 3 volume biography on Hitler. I have. One of his best in my oppinion. A must-have for any history buffs like myself. I've read several tomes on Nazi Germany. This is definitely a valuable contribution to the analysis of how a civilized nation could succumb to murderous fanatics. The author probes Goebbels' diaries in parallel with news reports, other historical documents and more to try to understand how Goebbels, head of propaganda, could become what he became and do what he did. 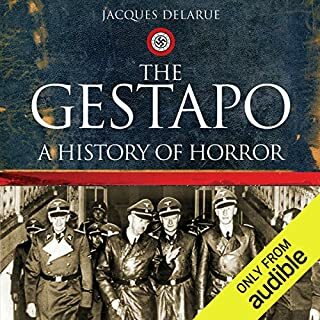 Listening to this (well produced) audio book leaves the reader struggling to explain how Goebbels ever managed to become one of the most successful and influential practitioners of propaganda the world has seen. The author seems more interested in cod-psychology and value judgements which really tell us nothing about the methodology behind the man's work. By the end you can't help feeling Goebbels succeeded in spite of himself. But if any old venal, fawning and corrupt wretch can achieve this much then why are advertising execs paid so much? I can't believe this is an entirely accurate assessment of the man's diaries.